We the undersigned, are asking the House of Representatives and the Senate of the Philippines to Uphold the Ban on Incineration, as mandated by the Philippine Environmental Laws: RA 8749 or Clean Air Act and Ecological Solid Waste Management Act of 2000: RA 9003, to protect and advance the non-negotiable right of the people to a balanced and healthful ecology in accordance with the rhythm and harmony of nature. It is not safe and is in fact dangerous to the health of the people and the environment. Even the most technologically advanced incinerators release numerous toxic pollutants such as but not limited to dioxins, furans and heavy metals that cause cancer and respiratory diseases and contaminate the air, soil and water. It contributes to the devastating impacts of climate change and violates the climate change act which requires government to integrate climate change in all policies, programs and projects. It destroys our finite resources which encourage an endless cycle of extraction, processing, production, distribution and disposal of products and materials — processes which release huge amounts of carbon dioxide, a known potent greenhouse gas. It is a waste of energy and competes with recycling and composting. Incinerators need to burn energy-rich materials like paper and plastic to generate very minimal electricity, whereas, recycling and composting conserve 3-5 times the amount of energy produced by incineration. Incineration is the most expensive waste treatment option thereby, is a waste of public funds. Incinerators in the United States and Europe cost a minimum of USD 150 million or more than PHP 6,500,000,000 using current exchange rates. These billions of pesos could fund thousands of Materials Recovery Facilities, hire barangay eco-aides and collectors and provide alternative livelihoods for the wastepickers. It will still create a need for landfills. Incineration produces toxic ash and air particulates that will still need appropriate treatment and storage, and the capacity of LGUs to manage them. It undermines the effort of our local government units to minimize and segregate our waste. Incinerators feeds on waste thereby encourage the public to create more waste rather than avoid it or produce and consume sustainably. Re-introducing incineration in the Philippines will be contrary to our obligations under the Stockholm Convention on Persistent Organic Pollutants (POPs) where Philippines is a signatory. It calls on Parties to take action to eliminate the production of POPs and minimize their unintentional sources. Globally, there is a strong move away from incineration and towards Zero Waste. In the United States, no new incinerators have been built since 1997 due to strong resistance from the public, health risks and high costs. When Congress approved the Ecological Waste Management Act and the Clean Air Act, we applauded the institution for having the vision and courage to address the root causes of our environmental problems. The solutions lie in the full and faithful implementation of those measures – not in the anemic execution by relevant or short-sighted authorities or in attempts by some legislators to water down the important life-enhancing provision of these landmark measures. 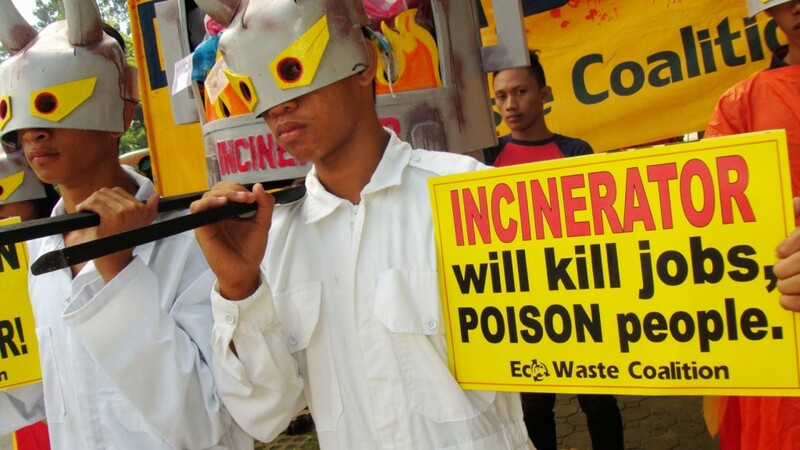 Please sign this petition and together let’s ask the House of Representatives and the Senate of the Philippines to Uphold the Ban on Incineration, protect the people’s sacred environmental rights and implement the mandates of the CONSTITUTION, RA 9003 and RA 8749. *Excerpts from the Position Papers submitted by EcoWaste Coalition, Global Alliance for Incinerator Alternatives, Greenpeace Southeast Asia, Health Care Without Harm, Mother Earth Foundation and Philippine Earth Justice Center to the House of Representatives last December 4, 2013. See the complete petition and sign it! Comments Off on Petition: Uphold the incineration ban in the Philippines!